Zoe’s Tale wouldn’t work if it weren’t for Zoë. John Scalzi insists the character is not based on his daughter. But he has poured enough paternal love into the creation and development of his plucky teen heroine to raise global sea levels by a full meter. Result: the character breathes such life and warmth from every page that it helps offset those parts of Scalzi’s story that could have easily tipped the book into mawkishness had it come from a less capable writer. Scalzi is fond of Big Emotional Dramatic Moments, the kinds of scenes in Hollywood films accompanied by a violin section louder than Ozzfest. But in Zoe’s Tale those scenes achieve their desired effect, because, in contrast to most of said films, the sentiments are neither dishonest nor unearned. Second point: Zoe’s Tale comes the closest any writer has come to replicating the spirit of a Heinlein juvenile and pairing it with a 21st-century sensibility. Scalzi’s Heinlein influence has been made much of. But here, the fidelity to the aesthetic of those classic books is tangible. Elements of so many of the juvies — Tunnel in the Sky, Farmer in the Sky — make themselves felt. While Zoe’s Tale isn’t being marketed as young adult, it would make fine starter SF for young readers. Girls may well find a lot to like and aspire to in Zoë’s character. This book is to the Hugo-nominated The Last Colony as Ender’s Shadow is to Ender’s Game, a parallel novel retelling an existing story from a fresh perspective. 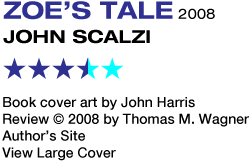 Zoe’s Tale does assume you’ve read Colony, and although it can be read as a stand-alone those of you who have read the preceding book will have an easier time slipping into Scalzi’s universe, aware of the backstory. Zoë Boutin-Perry travels to the fledgling colony world of Roanoke with her adoptive parents, John Perry and Jane Sagan, who have accepted positions as administrators. If you’ve read Colony, you know how this all works out. If not, I can give you the bit you could predict on your own, without too much spoilage: stuff goes wrong, nothing is as it seems. Zoë’s stuck in a strange situation. She is under the permanent protection of bizarre aliens called the Obin, for the reason her late biological father developed the technology to give the Obin consciousness and self-awareness. Two of their number — who manage to provide the book with heaps of comic relief simply by never trying to — Zoë has named Hickory and Dickory serve as her bodyguards, a fact that tends to cramp her style as she moves through that emotionally frought period of life between childhood and adulthood. She is at the center of a critical treaty between the Obin and the Colonial Union, which often causes her to resent the fact that what she is matters more than who she is. Scalzi deftly spins a touching coming-of-age story within an overall plot framework that he’s already established. He wastes little time retelling scenes from Colony. When the plot of Zoe’s Tale reaches its inevitable points of overlap (most notably the arrival of a Conclave fleet above Roanoke), Scalzi breezes over the details, perhaps a little too confident of readers’ familiarity with the earlier book. Those of you who have read it will appreciate the non-redundancy, as I did. But newer readers may feel the book is holding out on important information. But what Zoe’s Tale does do admirably is caulk over Colony’s narrative holes. We get a much more satisfying — oh, let’s be honest, the scene is fantastic — explanation as to the abrupt appearance and disappearance of the planet’s indigenous, intelligent “werewolves.” And if it paints Zoë as some kind of courageous-to-the-point-of-lunacy supergirl, well, screw it, it’s her tale. She was raised by space marines after all. Also, the climax, though it adopts a shift in the story’s tone that is probably inevitable given a shift in setting, serves the purpose of all good coming-of-age stories, in which Zoë is presented with choices that will determine just how ready she is to cross that adulthood threshold once and for all. I do think you’ll come away from this book with a fondness for its heroine and a heartfelt investment in her life and her journey that many SF novels don’t offer. At least, not with that classic Heinlein flair.